10.19.09 = Just a little slice of Americana today, I've been traveling so much lately it's nice to shoot something right up the road. 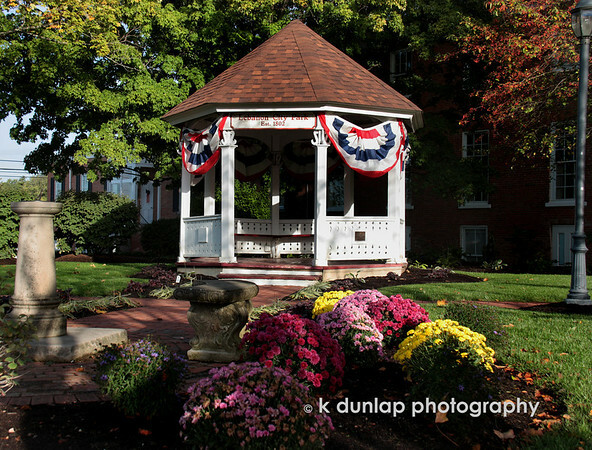 This is the gazebo in front of the famous Golden Lamb in Lebanon, Ohio. The Golden Lamb Inn, is the oldest Inn in Ohio, since 1804. Over 12 Presidents have stayed there and countless famous historical figures. A famous English writer and poet arrived one day; Charles Dickens. Nicely composed shot and full of colour too. wow looks like a postcard! beautiful capture! This would make a beautiful postcard! Very nice. I would like to sit there awhile. The mums are beautiful with the gazebo.